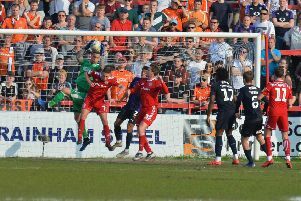 Hatters striker Danny Hylton has demanded his side use their disappointment at missing out on a trip to Wembley as motivation to fire themselves to promotion this season. Town’s leading scorer reached 20 goals for the first time in his career during Wednesday night’s 3-2 defeat against his former side Oxford United in the Checkatrade Trophy semi-final, only for Marvin Johnson’s late winner to send the visitors through. However, Hylton doesn’t expect his side to be suffering any lasting negative effects when they take to the field at Yeovil this afternoon, saying: “I don’t think there will be any hangover, if anything we’ll use it as motivation. “We’ll say ‘this wasn’t meant to be, the league’s our bread and butter, lets go and flipping put this disappointment to bed’. “The celebration will be much better to get promoted than to get to Wembley, so let’s use that disappointment and turn it into a positive. “It would have been a great day out, but we switch on to the season now. We’ll say ‘this wasn’t meant to be, the league’s our bread and butter, lets go and flipping put this disappointment to bed’. “There’s a huge disappointment after today (losing to Oxford), but it’s going to be 100 times worse if we were to get into the play-offs and lose. Town go into the game at Huish Park four points behind third placed Carlisle United with a game in hand as the Cumbrians lost on Tuesday evening, as did Plymouth, while Portsmouth could only draw at home to Morecambe too. Hylton continued: “Obviously a few results went our way the other night, so we’ve got to try and capitalise on it. “You might think one of the top teams has got an easy game against one of the bottom teams, it’s not like that at this stage of the season. Meanwhile, on-loan Arsenal keeper Matt Macey was also confident his side would have no problem in putting Wednesday night’s defeat them and hopefully end a run of two successive League Two draws with victory at Yeovil. He added: “Everyone’s disappointed because we wanted to go to Wembley, for the fans, for the club, it’s such a massive occasion, but football requires you to move on so quickly and sometimes that’s the best thing. “The next game comes round on Saturday, we’ll definitely be at it because it’s such a massive game. “Every game is must win at this stage of the season and our mind going into every game is that we can win. “The way we play it’s positive, so for us, we focus on ourselves. “Results obviously helped us yesterday (Tuesday), which is nothing we can do about. “If they’d been unlucky results, we’d have gone with the same mindset to Yeovil on Saturday. But I firmly believe, if we worry about ourselves and we get the business done, we’ll get rewarded for it. “The last three games we’ve come up against you would call them big games and opposition that are technically higher than us in the ladder. For me all three games we’ve been unlucky not to win, especially the two league games.